Brooke’s room has always been a disaster. I go in a few times a year and deep clean it for her- sort through her stuff, reorganize everything, straighten all her drawers and boxes…..and it slowly gets back to the above “normal”. I can’t complain too much, because I was a messy child myself. I called it Organized Messy, because even though my room was a disaster zone, I usually knew where everything was. It was under that pile, or in the back of my closet, or in the middle of my top drawer, etc. Brooke, however, is not Organized Messy. She can’t find anything, she loses things all the time, I can tell she is overwhelmed by her room. She simply avoids her room. If I would let her, she’d sleep in her sister’s room and only use her bedroom as a closet and storage space! I read it, and could see myself and our situation in this story. But it also hit home on another level…. Brooke has started showing signs of facial twitching and tics. I didn’t realize this until I Googled her symptoms (more on that later), and it suggested that this is often a response to stress and anxiety. 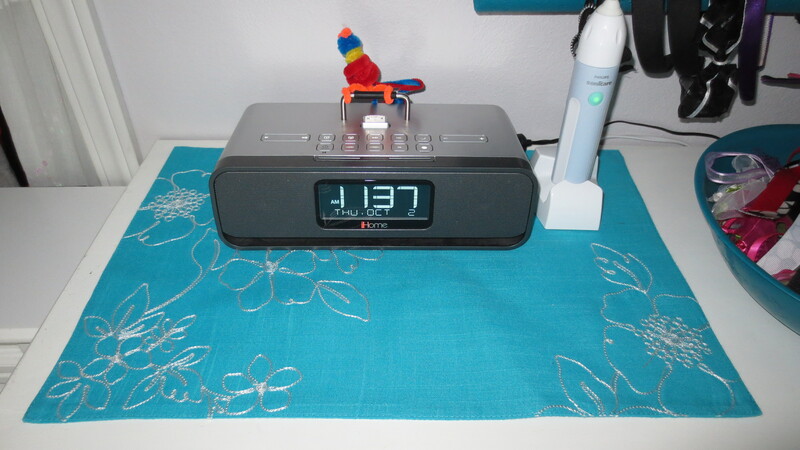 She doesn’t seem stressed or anxious, but thinking about her bedroom and the article- I realized that a disastrous unorganized chaotic bedroom does not help one to feel calm and peace. She’s been begging me to rearrange her room, and the past couple weeks she’s been talking about redecorating it and changing the color of it. Maybe that’s what we need to do? Give her a bedroom that is a calm and peaceful sanctuary where she can relax and unwind. We will PURGE her bedroom of EVERYTHING and repaint it in a soothing color… then move ONLY the basics back in: bed, dresser, cubby, desk. Scale back her toys, scale back her clothes, scale back her STUFF. A friend suggested we look into Feng Shui. So I did, quickly, and learned that her bedroom layout has been ALL WRONG for the past several years. ALL WRONG. With poison darts and her bed in the mortuary (dead man’s) position. Her bed should be in a commanding position, and no poison darts (sharp cornered furniture or decor pointing at you while you are in bed). This was on Friday. That day, when she came home from school, I announced that we would re-do her room. Together, we looked through “Feng Shui bedrooms for kids” and she really loved the turquoise/gray/white color scheme….so we started searching for any bedroom with that color scheme. We hauled everything out of her bedroom….EVERYTHING. 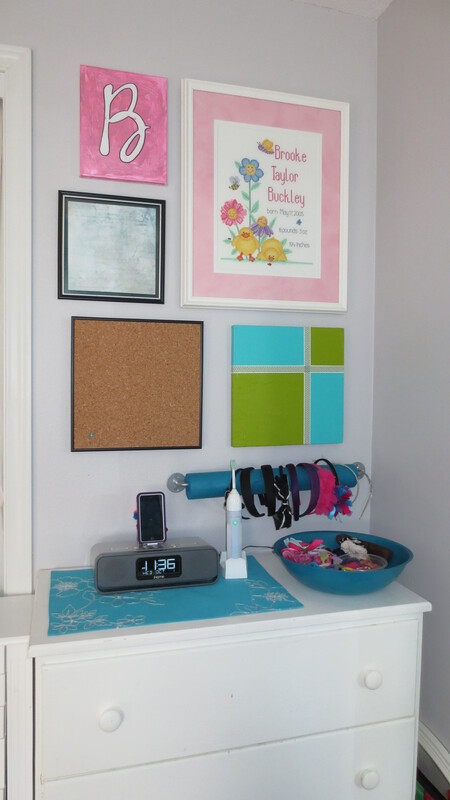 I patched the holes in the wall and painted over the pink, making her room a perfect neutral light gray color. It’s called “Silver Spoon” by Olympic (Lowe’s) except I only use Miller Paint’s Acro Pure, so I had Miller mix the color for me. Once the walls were dry we started with her bed. We dismantled the bunkbed and changed it to just the bottom half. That makes the room feel much more open and bright already! She was excited to not have a bunkbed anymore. (The top is completely dismantled and currently stored under her bed- we have the whole thing listed on Craigslist, hoping it will sell). She weeded through her bazillion socks and underwear and winter gear and swimsuits- we donated a huge sack to Goodwill (and what wasn’t worthy of Goodwill we put in the clothing recycling bin at Far West Fibers). Now she has one drawer for winter wear and swimsuits, a drawer for pajamas, and a drawer for socks and underwear. I did allow her to keep her top drawer as her “personal care” drawer. It is NOT a junk drawer. She has a “Special things” box to put her “junk” in- lol. But only one box, and she’s in charge of maintaining it. No overflow. 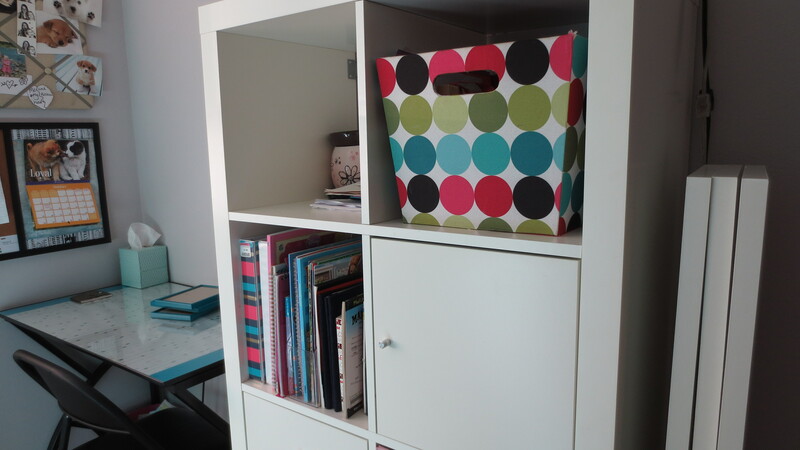 It’s the colorful dots box seen here…. Which brings me to her cubby. This is how it looked before…. Next up was her desk…..OMG she had sooooo many crayons and markers and pens and pencils and STUFF. And the desk is so small that there wasn’t any room to even USE the desk when all that stuff was being stored on top of it. All of her desk supplies have been limited to one of the drawers in the adjacent cubby….and a cute turquoise cup on her desktop. Now she has room to do her homework, or draw or color! I’m hoping to find a 24×36″ bulletin board to hang above her desk….still searching for that. We did find these two boards at Goodwill…..
And the silly corner shelf way up high, that was leftover from when the bunkbeds were there (as a place for the upper bunk to keep tissues, or a cup of water, or anything else needed in the middle of the night). Now it’s a trophy shelf. Getting back to the cubby….and scaling back her STUFF…. There’s a cube for books, notebooks and papers, another for her “special things” box, one that is open to display trinkets and things (currently holding a broken Scentsy and a stack of papers), and all her electronics charging cables, ear buds, game systems go in the other small drawer, out of sight. And the small top surface only allows her to keep a few of her favorite things….which are all PINK. A SCALED BACK and simplified bedroom. Now comes the fun part of decorating it! Not wanting to spend a ton of money, we hit up the local Goodwills and came up with all kinds of fantastic things! Picture frames, bulletin boards, some art work…. I hung it above her dresser. I had a turquoise placemat that I put on her dresser…. 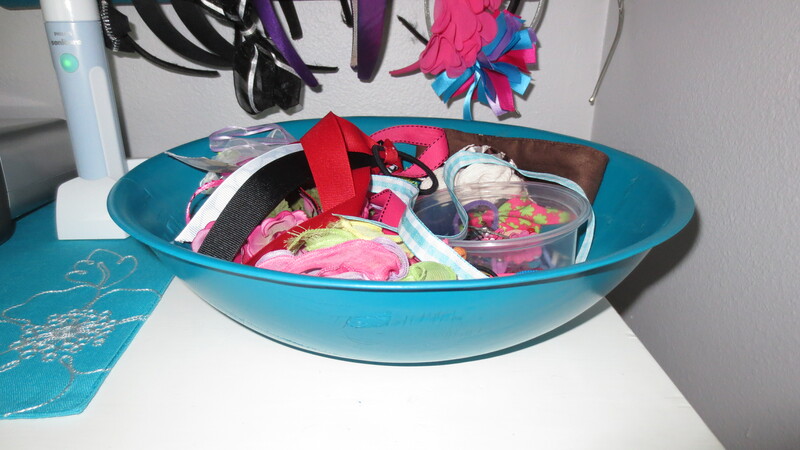 She picked out a bamboo bowl (to keep her hair bands in) and I painted it to match the same turquoise color…. I used a Pool Noodle on a towel bar as a rack for her headbands! Another Goodwill find was a shower curtain that we hung as a bed backdrop. And she picked out a zebra lamp so she could read in bed. OH, we also found an old nightstand at the Goodwill Outlet…it’s in the midst of being repainted to match her room- and I’m hoping to find a matching drawer pull like the original pull on the top drawer (did you notice they were mismatched?). Stay tuned for that! All in all…. we spent about $125 (that includes the paint, the comforter set, and all of her artwork/bulletin boards/trinkets). And I am in LOVE with the new look and feel of her room. She spends a lot of time in there now, and loves to read in bed, and goes to sleep about an hour earlier, too! Here’s some full view shots…. We still have some fine tuning to do. She picked out some 5×7 picture frames that she wants to put pictures of our family in. We have to get the nightstand in place, then decide if we are going to re-hang one of her shelves to display her ‘special’ items, or put the picture frames on, I don’t know. There’s lots of time to decide on that and we certainly don’t want to fill up and clutter her room. The more “blank” space the better, in my opinion. Thus, no turquoise drapes or curtains, no turquoise panels for the closet, we are keeping it light and flowy and simple. Previous Previous post: Not an Ordinary Saturday Night…. Next Next post: A New Symptom…. Usually interviews use speaking heads (to digital camera) and voiceovers (to photos).